Good morning, everyone -- I have some more good news for you. The hard work on the book is finally done, all the maps in the colour section are drawn and the captions finally written, re-written, edited and approved. The chapter headings are complete, and in the process of doing this we have exchanged a less important map for another of greater importance, greatly enhancing the book. The last questions have been answered, the last inconsistencies in spelling corrected -- it's amazing how much work goes into perfecting a book for publication. Five or more Heritage House staff-members read the book and every person had different comments or questions for me -- and many of those questions were very good. Is it B.C. Police or B.C. Provincial Police? West Road River or Westroad River or Black Water River or Blackwater River and when do we use West Road River and when Blackwater as they are two different names for the same river? Thompson River or Thompson's River? La Traverse or Little Fort? Lac Round (as A.C. wrote it) or the more correct Lac Ronde? I think I have answered hundreds of questions in the last few weeks, and often came home to another twenty questions to answer before morning. But I think this detailed work is finished, and the book is heading off to the printer. This does not mean that the books will be rolling off the press immediately -- there is one more step to come. The printer will make the blueline proof -- that is, the film from which the book will actually be printed. Bluelines are proofs of the page negatives, printed in blue ink and made into a book of sorts -- an actual representation of the book with each page in the place where it is supposed to be. The editor checks the proofs to ensure that no errors have been introduced during the printing process, then returns the bluelines to the printer. After that the actual printing and binding of the book begins. But I hope we will have books in hand as we approach the Heritage House Author Celebration in November. I have been fascinated by the whole process and I wish I could watch this part, but it is now my job to stay out of the way and let the publisher and the printer do their work. I will see the finished product in a few weeks time. Now that the book is out of my hands, do I have more free time? I have to write three speeches that I will be giving in the next few weeks. I must learn Power Point, but I don't know if I will be using it for all three speeches -- I have to find that out, too. I have already mentioned the Heritage House Group Author Celebration -- now let me tell you about all three upcoming occasions. The Heritage Group Author Celebration will be held on November 17 at the Maritime Museum (Bastion Square), at about 7pm. in the evening (I don't actually know yet when it starts). This is an upscale event and if you are coming, you can dress up -- my sister says she is planning to wear her Christmas sequins! It is a shared evening, with ten different authors from the various publishers under the Heritage umbrella speaking about or reading from their newly published books. I will be there with a five or so minute talk -- and someone told me that this short speech will be the one most difficult to write. About a week after that event, I will be speaking on the book in front of the Victoria Historical Society, which has its meetings at the James Bay New Horizons Centre at 7:30 pm. This will be a three-quarter of an hour talk and I will hopefully know my Power Point by then so that I can use a few of the many photographs to illustrate the difficulty of the expeditions Anderson made. Alexander Caulfield Anderson: The Pathfinder -- Nancy M. Anderson will speak about her ancestor's important role in developing new brigade trails for the Hudson's Bay Company in New Caledonia in the late 1840's. Her biography of A.C. Anderson will be published this fall. 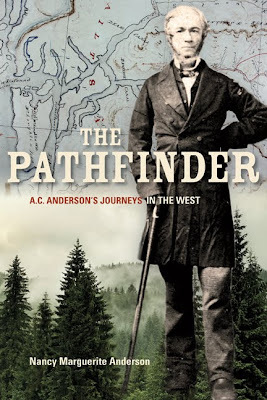 Finally, we will be holding The Pathfinder Book Launch on December 1st, at the Crown Bookstore. As I have mentioned before I used to do a lot of shopping at the Crown Bookstore when it was located downtown. Now it is located close to the Parliament Buildings, and I suspect there will be plenty of parking available just across the street as the launch will be held in the evening, about 7pm. This event will be advertised in the local papers; and I will have to write a different speech for that event, as the speech I give in front of the Historical Society will not work at this event. So you can see I will be busy over the next few weeks. I am also planning a holiday -- it has been a few years since I have actually had a two week holiday but that is what I am planning. Much of it will be a work holiday, but I plan to spend a few days in Vancouver, promoting the book to the Vancouver area book stores. Okanagan is looking after itself and some members of the Historical Societies up there have been promoting the book up and down the valley during this time when they have been celebrating their 200th anniversary. The Hope Mountain folks all know about the book too, are we are arranging a visit to Hope so that I can speak about the book -- sometime in the New Year. I hope weather allows me to travel up there easily, and we will have to discuss what to do if the winter travelling is as difficult as it is forecast to be, at the time I have to travel. Bookstores are now placing their orders for this book, and by the time I visited many of the Victoria bookstores, they had actually already placed their orders. I think that you can now order the book through the Heritage House website, at http://heritagehouse.ca -- go to Fall 2011 catalogue. I say, "shop at your local bookstore" -- but I also know that many small communities don't have a local bookstore and so you will be shopping online. Many small museums will carry the book, but they are often closed during the winter months -- or only open on long weekends or for special events -- and so shopping at these small museums is also difficult. So, by all means, order your book online and you will receive your copy as soon as it is printed up! E-books are also available, but you will have to wait a month or two before the books is set up on the server and all the wrinkles ironed out. AS an author who writes about the fur trade I have been following your blog for a long time. Fascinating! So happy to see the achievement and will buy your book as soon as I can. Thank you thank you, Julie.